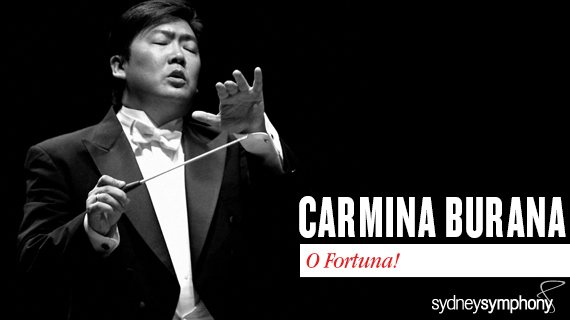 Sydney Symphony presents Special Event with Premier Partner Credit Suisse, CARMINA BURANA in the Concert Hall at the Sydney Opera House. 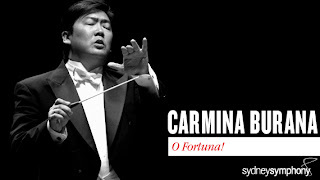 CARMINA BURANA by Carl Orff was presented by the Sydney Symphony Orchestra as a special event conducted by a Chinese conductor, Long Yu. It also created an opportunity to introduce a Chinese composer (now French citizen), Chen Qigang to a Sydney audience. The work was ENCHANTEMENTS OUBILES (FORGOTTEN ENCHANTMENTS) - 2008. It is for an orchestra of strings, harp, celesta and percussion - there are no woodwinds or brass instruments. Soaring, floating string melodies juxtaposed with vibraphone and marimba. (Six busy percussion instrumentalists!). 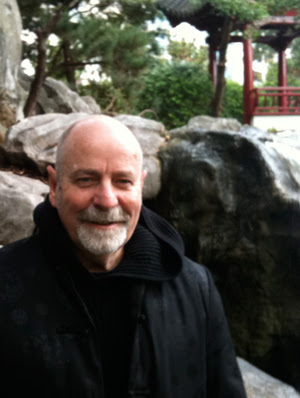 The composer grew up in the repressive era of the Chinese Cultural Revolution, and, in the 1970's was one of 26 students chosen to study at the Central Conservatory in China, studying composition with Luo Zhonghong. In the 1980's he studied further, in France, having been influenced by the music of Debussy and Ravel, he found a mentor under the guidance of Olivier Messiaen in Paris. The experience of the music is simple , a sense, for me, of a feeling of the ethereal, the themes of the strings a little tritely familiar (I kept hearing Tan Dun's strings from CROUCHING TIGER, HIDDEN DRAGON -an illusion, perhaps), but contrasted by the bubbling, generous oriental exotica of the percussion, which always revived my interest. Delicateness. On the other side of the interval, CARMINA BURANA by Carl Orff is a monumental work of scale: "In addition to the three soloists, chorus and children's choir, CARMINA BURANA calls for three flutes (two doubling piccolo), three oboes (one doubling cor anglais, three clarinets (one doubling bass clarinet and one doubling E flat clarinet), two bassoons and contrabassoon; four horns, three trumpets, three trombones and tuba; timpani and a large percussion section; celesta and two pianos; and strings". This work is a seminal work in my education, introducing me to the world of classical music, it being an almost daily part of my training as an actor under the guidance of Margaret Barr at the National Institute of Dramatic Art (NIDA) - those were the days, when training was training! There is, to some of the music, a body memory twitch, that has me standing at a ballet bar, "brush, brush, forward (ing)' with my feet. In fact, I reckon, that if you could put Ms Barr's students in the Concert Hall you could spot us all by that automatic body memory, moving in exercise to the sounds. "Brush, Brush forward. Brush, Brush back." The work inspired and thrilled me as a youth. I have heard it many times, brainwashed to attend the concert hall where ever, whoever is playing, singing it! This work first heard in 1937, in Frankfurt, and is based around a large collection of medieval poetry (320 poems) discovered in 1803 in the abbey of Benediktbeuern in Bavaria. Orff selected some of the poems and built a work of song and dance around the Wheel of Fortune, the celebration of Spring in the meadows, shenanigans in the tavern, and the Court of Love. Rousing, religious, irreverent, funny, full of sexual longing and satisfaction, the 65 minutes of music sweeps one away into a sophisticated kind of 'barbarism' and sexual fantasies. It can be a transcending experience. (I have never seen the work as Orff conceived it:a scenic cantata - "Profane poems to be sung with singers and dancers" - a stage work. Based around my knowledge, only as a listener, having had several recordings of this music over my life time, I felt , from memory, that Long Yu took this work savagely and whipped the pacing of it at a breathlessly mighty gallop. Certainly Mr Lu was extremely energetic in the conducting, quite a workout. Not all the collaborators kept up with him. The baritone, Changyong Liao, was the most impressive of the soloists, joined by Paul McMahon (Tenor) and Milica Illic (Soprano). The Sydney Philharmonia Choirs (Elizabeth Scott) and the Sydney Children's Choir (Lyn Williams) gave body and power to the great and famous moments. The opening and closing of the work: FORTUNA, IMPERATRIX MUNDI (FORTUNE, EMPRESS OF THE WORLD) with the full orchestra and the choir are always sublime moments of thrill. I loved it, but am, of course, unbelievably biased by my memories of a golden past time! P.S. Forgot to thank the Company for FREE programs. The Sydney Dance Company, the Sydney Symphony, The Australian Chamber Orchestra, give FREEE Programs. Usually $10 at Sydney Theatre Company. $6 at Belvoir. $20 at Opera Australia. Being a cynic, is the price the programs at such outrageous levels, too costly for the ordinary, regular playgoer ,thereby keeping the audience ignorant of the artists involved , a way to stop the artist from becoming too famous so as to keep the artists bargaining power for wage fees down? Silly idea, of course. But being a cynic......well? I mean, couldn't the theatre Companies provide, like the Opera and Ballet company do, an A4 page or smaller, with the relevant information on it, and have it given away by the ushers? Although the new STC programs are an improvement on 2011's season. They started marketing them as "enhancing your experience", which was precisely the type of argument I had for why programs are important, back when I used to review them on my blog. In my more deluded and egotistical moments I like to think that - artists and critics being a symbiotic bunch - I was the reason for the improvement, but I doubt I was even a glimmer in the minds of the publications department when they made the change. Not that the programs are particularly mindblowing now, anyway. I wish I could've seen Carmina Burana, but I had Warhorse, Carmen, and The Addams Family scheduled instead. Still, life wouldn't be anywhere near as interesting if one didn't have to make choices!